Ambassadors, mercenaries, pontiffs and traders were key actors during the dark and transformative Middle Ages. What does that time have in common with today? And there, Khanna argues, is the connection between the 1400s and today: Both times featured public and private stakeholders scrambling to gain legitimacy with none holding absolute power. Khanna spoke with Devex about development and diplomacy in today’s globalized world. In your most recent book, you conclude that the current state of the world is much like the Middle Ages. Please explain. Actually, I don’t so much conclude with that proposition as really start with it as a baseline, because I think people need to have a common understanding about exactly the sort of situation we are in. If you think it is a situation where the G-20, World Bank, IMF or U.N. just need to be reformed and then the state-centric order will then be able to cope with all of the trans-national challenges in the world, then you have a very different starting baseline or assumption than I do. [My assumption] is that most of the governments of the world have very different levels of capacity, and you can’t wish that away through crafting institutions which give them equal status and authority. And instead, you have to accept that globalization is the new baseline and globalization as a baseline has an effect of empowering a tremendous, deep and diverse set of actors and that the power of globalization to do that is far greater than the power of any state to contain it – even China, even Brazil: No matter how many rising powers we have, it doesn’t mean we are not going to have simultaneously the rise of corporations, NGOs and other players. So, that’s why I accept this “Middle Ages on steroids” type of analogy that I am making in the book. What is “mega-diplomacy” and how does it affect aid organizations? Let me say something about the fact that you [Devex] are a marketplace in a very literal sense of the term and in that marketplace, you have a variety of actors, traditional donors as well as non-traditional or new ones. And I think what that reveals is something that is a much broader point: You are a microcosm of a much broader picture in which basically any actor that has the resources is also considered to have the authority, responsibility and legitimacy to act on a challenge. Any bid or tender out there can be taken by anyone – an NGO, private equity fund or development agency or whatever the case may be. So, that is really why I used Devex in the book, because I really think you [Devex] are a microcosm of that broader sphere. And the philosophical underpinning of that is, you know, when [U.N. Special Representative of the Secretary-General on Human Rights and Transnational Corporations and Other Business Enterprises] John Ruggie wrote back in 2001-’02, now that there is a deadline for the Millennium Development Goals, 2015, everyone is responsible and it does not matter who does it. Legitimacy accrues to those who act and not to those who just talk. To me, most of the world’s problems now fall under this category were mega-diplomacy is the primary vehicle in practice if not in theory of dealing with them. And I think that theory needs to catch-up with practice in many ways. [Devex] is an example of mega-diplomacy already being carried out all over the place and yet in our mindset we don’t really appreciate it. How would you say aid workers or social entrepreneurs can better prepare for this world where mega-diplomacy is the tool to solve a lot of these problems? How does mega-diplomacy apply in Egypt and other countries that are experiencing political turmoil or upheaval? There are so many causes to the unrest there. I mean, if you break it down and say, look, this is a political crisis because it’s an authoritarian regime, well, you haven’t had political pressure on that regime to change its constitutional structure away from a strongman presidential rule towards a parliamentarian one coming from Western governments, certainly not from the U.S. But you have had NGOs pushing for free media, naming of judges from an independent judiciary and for human rights. So, in that sense, you had a tremendous amount of pressure applied by non-governmental actors in ways that governments didn’t do. So that’s just on the political level. Then on the economic level, you have a situation where you have tremendous amounts of economic alienation and disenfranchisement and food price spikes because of lack of a strategy for food harvesting and food storage and things like this have really impacted the population. And so there you have actors from international agencies, World Food Program and others, including NGOs as well and companies that are going to be necessary to really create a more resilient food supply chain in the country, if you want to have social stability. Then you have security issues. Let’s say you have a country that is ripe for unrest and religious militancy, and you want to confront that through education. Well, the educational system in the country is not very good, is it? So, you are going to need a lot more presence of Western-financed and Western-backed universities in the country to kind of revive the vocational, secondary and tertiary educational system in the country. That is not something that government alone can do and it’s not something that the international community is going to do. It is the private educational institutions working with public actors to create. You argue that in a globalized world, organizations that have the most impact on people’s lives will be the most powerful, whether they are governmental or not. How can we hold some of these newer actors accountable and make sure that they don’t fall into some of the same traps that their predecessors fell into? I don’t think we have a world or system of genuine accountability. We only have domestic accountability; we have very little international accountability. We see that sanctions mechanisms and suspension of membership and these various types of things, whether it’s U.N. bodies or the Commonwealth, don’t really work, and sanctions don’t really work either. So, we have very little international accountability, let’s face it. And then, proposals for how you bridge the democracy deficit in international agencies have really gone nowhere either, because there is no such thing as international democracy. So, what I try to do is not waste any time with those straw men. I don’t think the Gates Foundation should be dismissed as an important actor because it is not held accountable to voters in Texas. Even our own government in the United Sates doesn’t seem to be very accountable to its own voters. So, I don’t really waste my time with ideal types. This is a book that arguers that if you have mutual accountability – and that is the key term, mutual accountability – in these coalitions of mega-diplomacy, then everyone is monitoring everyone. Then, no one is privileged: The government is not privileged for making pledges that it doesn’t meet, the government makes pledges that it is held accountable to, and it is shamed or ignored or kicked out of coalitions if it does not meet its pledges. The same thing goes for companies. The other interesting thing is that if you think about when people say [something like], the Gates Foundations is not accountable, people forget that they don’t have an army; they operate in foreign countries at the invitation of those governments. Even if there are perverse side effects to some one of their work which is skewing resources away from certain public health infrastructure, which they are often accused of, that still is the result of polices that are accepted by the host government. So, I think it is very important to remember that. So, I think we have to remember that accountability is the highest virtue, not democracy. Democracy is one form of accountability, but not the only form. 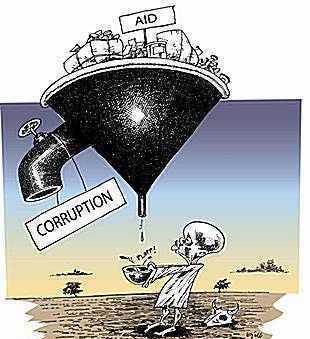 And when it comes to NGOs and companies, you have peer accountability through transparency sown in to anti-corruption programs. For example, you have consortiums of companies through industry groups that have agreed to do things, like “Publish What You Pay.” And so, you have a private-level industry-wide mutual accountability which is called peer accountability when you are being monitored by your peers. Then there is reputational accountability through transparency and media and shame. There is financial accountability, your accountability to your shareholders, to your stakeholders, to your donors and to your funders, things like that. And then there is also mutual accountability that within a coalition, one can be jettisoned or shamed or whatever the case may be. So, I think there is many kinds of accountability that we have to appreciate. There’s a longstanding debate over the three Ds: development, diplomacy and defense. How different are their objectives; can they work together? To me, development is a part of the diplomacy, it is the substance, not the style – and most countries, as you probably know very well, are much more interested in substance than style. They don’t really want town hall meetings, they want to see money, and they want to see investment. If you add in another category like [foreign direct investment], would that be separate from development; would that be separate from diplomacy? There are so many countries in the world were America’s foreign policy, America’s footprint, America’s diplomacy, is basically just facilitating investments by American companies. There is really nothing else we have to say or do there. And the only thing that people care about is how many planeloads of businesspeople are you bringing. So, out in the real world, outside of the [Washington] Beltway where we sort of live, these things don’t really have very hard distinctions among them. And as you know very well, even the military carries out development work. Just look at the Horn of Africa and other countries were special forces operate, where they spend all day digging wells and trenches. So, in theory, these things can be distinguished, but it’s not even good theory let alone good practice.